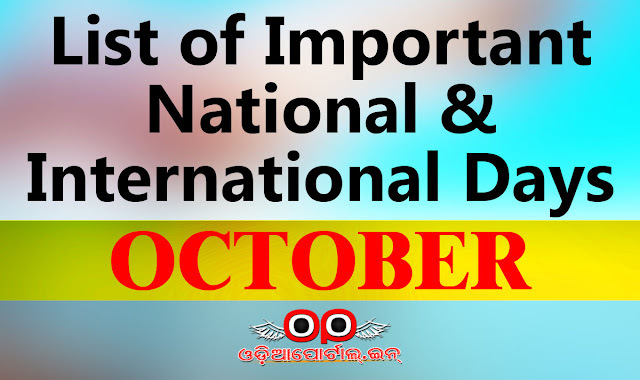 List of Important National & International Commemorative Days for the Month of October. National & International Commemorative Days "October"
October 4 — World Animal Welfare Day. October 5 — World Teacher’s Day. October 6 — World Wildlife Day. October 6 — World Food Security Day. October 8 — Indian Air Force Day. October 9 — World Post Office day. October 10 — National Post Day. October 10 — World Mental Health Day. October 12 — World Sight Day. October 24 — World Development Information Day. October 30 — World Thrift Day.